We specialize in fire extinguisher service and fire suppression services for businesses – so let us help you get a plan in place to protect your employees and assets. We’ll come to your location and help you make sure your business is compliant with all laws regarding fire safety. 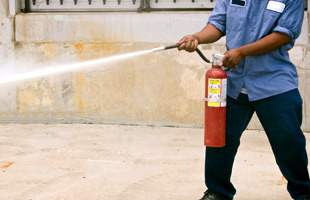 Fire extinguisher service: Every company or business is legally required to have their extinguishers maintained on a regular basis to ensure proper operation. Check that requirement off your to-do list with our convenient, affordable help. 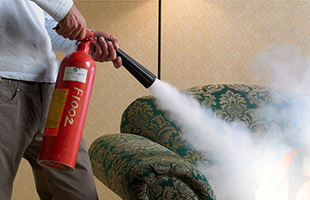 We have a full-service shop that can inspect, maintain, service, or recharge any type of fire extinguisher. Our 24-hour mobile fire extinguisher service vans are available to inspect and maintain your fire extinguishers on a monthly, quarterly, semi-annual, or annual basis. Restaurant fire suppression service: In the event of a fire, a fire suppression system can make a huge difference in saving lives and keeping your building intact. We’ll design and install an automatic fire suppression system for you that meets the requirements of the UL300 code and NFPA #17A. To maintain its UL300 listing and current code requirements, your automatic fire suppression system must be inspected on a semi-annual basis by a certified technician. When employers have provided portable fire extinguishers for employee use in the workplace, OSHA law requires that those employees be trained on how to use a fire extinguisher – and that’s where we can help you out. Choose the class that best fits your needs – we’ll come to your location and guide your employees through extensive training so they’ll be better prepared if a fire should occur in the workplace. Classroom Training: We will come to your location. Trainees are instructed on the classes of fire, the types and applications of fire extinguishers, the fire tetrahedron, and fire extinguisher operation. We also provide instruction literature, a PowerPoint presentation, certificate of completion for each participant, and a signed list of participants for the employer for OSHA verification. If you need more than one class that is in succession, we will adjust the price for the future classes. Hands-on Training: We will come to your location. This class is much more exciting. Until you have actually operated a fire extinguisher, you aren’t fully prepared to use one in an emergency. Hands-on fire extinguisher training is accomplished by lighting a diesel/kerosene filled pan on fire while trainees attempt to extinguish the flames with a fire extinguisher. This training class also involves everything in the Classroom Training. Participation is limited to 20 students per class. Monthly Training at Bekins Fire and Safety: This training will be held at Bekins Fire and Safety’s home office, 3400 Hwy 75 N, Sioux City. Its main purpose is to fulfill the OSHA requirements for those companies that only have a few employees and can’t afford to bring us to their location. It could also be for a new employee who missed the company training. These classes will be held on the second Tuesday of every month at 8:00 AM. Please call for an appointment. The class will be our Hands-on Training and will last approximately one hour. Call for pricing.